Another Friday night at the Thirsty Kitten. We had planned to open a Yorkville Cellars Malbec– had heard the cork popping in our minds all day Friday in anticipation. But when Kip went to the cellar to fetch a bottle (remember, we use the term cellar loosely), he came up empty handed. Apparently, the Malbec was so good we’d finished it all. This happens to us a lot. Never fear, we’ll restock and write about it soon. How could we ease our disappointment? Luckily, we didn’t have to cry long, as we decided quickly that we’d open a bottle of Iota Cellars Pinot Noir, the thought of which had us giddy with excitement in short order. Iota is located in Oregon and has all the qualities we relish most in a winery– small production, sustainably farmed, and family-owned. The Sandberg and Pelos households, related by blood, combined forces in the the late 1990’s to explore the dream of creating a winery from the ground up. They found property in the northern Eola Hills of Yamhill County outside of Amity, Oregon– part of the Willamette Valley. Johanna and Don Sandberg lived on the property, nurturing the cultivation of vines. From the beginning, Don specialized in vineyard management while Johanna focused on winemaking. Lynne Pelos shepherded the business and marketing side. 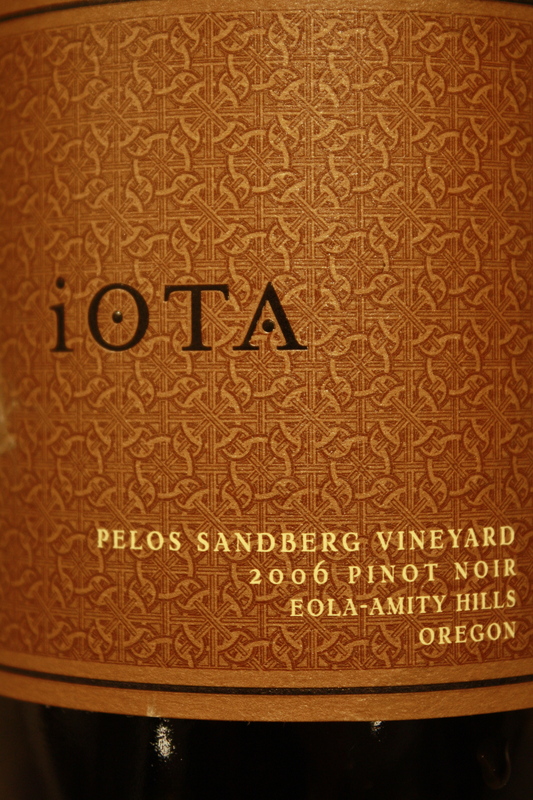 In 2006, they released the first vintage of their signature wine, Iota’s Pelos Sandberg Vineyard Pinot Noir. Originally from Minnesota, the Pelos and Sandberg families held a special launch here in the Twin Cities when the 2006 was released. Kip and I were lucky to attend. We sipped, we chatted, and we learned so much about the trials and tribulations of going from property acquisition to wine in the bottle– truly a labor of love for this family team. Incredibly impressed with the elegance and full fruit of their very first effort, we ordered a case. As a gift for our purchase, we received a beautiful Riedel wine glass etched with the Iota logo, made specifically for drinking Oregon Pinot Noir. Seriously! A glass crafted just for Oregon Pinot. How decadent and luxurious! (Don’t tell, but sometimes we drink California Pinot from it, too.) We adored the elegant, ample bowl, perfect for swirling and allowing the wine to open, and the ever so slightly turned out lip of the glass, which made every sip a pleasure. The bottle we opened last night was the very last of the case of ’06 Pinot. We always feel a twinge of sadness mixed with reverence when we get to the end of our supply of a vintage we’ve especially enjoyed. 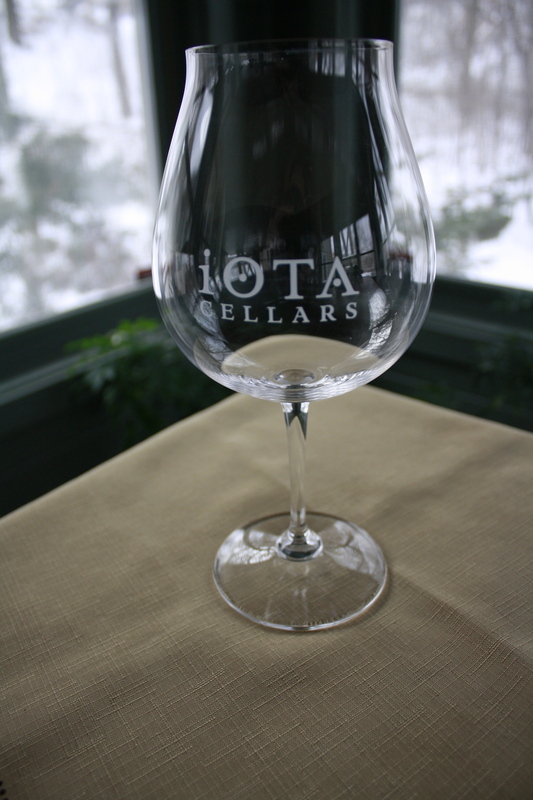 Usually when we sip Pinot Noir, and always when drinking Iota, we use our Fancy Glass. After some awkward attempts to share the single glass during a tasting, we’ve arrived at a system of taking turns so that we each have our fair share of time getting the Riedel to ourselves and feeling extra special. As luck would have it, last night was my turn. Our thoughts on the 2006? Upon first breathing the aroma, Kip said: “If I could smell this all day, I’d be a happy man!” It was lush and full of fruit on the nose. I tasted smooth, jammy plum on the front and tart cherries on the back end of the first sip. Kip tasted creamy vanilla, as well, and a touch of herbs. He said, “If I didn’t know better, I’d think this was a Martinelli”– extremely high praise, if you’ve ever had Martinelli’s legendary Pinot Noir, with Helen Turley as consulting winemaker. Honestly, it was so good, the wine practically begged you to take another sip . . . and another, and another. We forced ourselves, as best we could, to savor it slowly. At the end of the evening, we raised our Fancy Glass in a toast to the Sandberg and Pelos families, to their toil in the vineyard that is producing such divine juice, and to each of you, whom we could feel toasting with us in spirit. As always at the Thirsty Kitten, a good time was had by all. For those who prefer formal tasting notes, Stephen Tanzer’s International Wine Cellar rated the wine a 90, “Outstanding.” The review can be read here. Another great post Kitten! I have never had any Iota, but I sure will be on the lookout. Thanks for the read, TDC. Thanks, TDC! We were chatting about your amazing OTBN tasting while we sipped last evening. Cheers! We greatly appreciate your enthusiasm, Joyce. And just for that, you are going to receive a golden ticket– I mean, an invitation to sip wine in fancy glasses for real at The Thirsty Kitten. You see, dreams really do come true! living vicariously and smiling as i’m feeling “you” come through these words (and Kip too) :) love to the Thirsty Kitten(s?)! What an honor to be mentioned in your blog, Lucy & Kip. Thanks for raising your “single” glass to us! Thank you, SLW. Makes us happy to know we gave you a smile. The Thirsty Kitten does seem to bring out the best in both Kip and me. Who knew that wine could do that?! We send love right back to ‘ya! Thank you Lynne, Johanna and Don! We are thrilled you stopped in to The Thirsty Kitten to say hello. And so glad you liked the report on our iOTA evening that we so thoroughly enjoyed ourselves. We were just remarking that our supply of iOTA is unbearably low. It appears to be time for us to place another order!